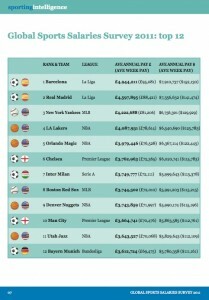 Barcelona are the best paid team in global sport measured by average first-team wages, ahead of their great rivals Real Madrid in second place, knocking baseball’s New York Yankees from the No1 spot, according to the Global Sports Salaries Survey 2011, to be published this week by sportingintelligence. The average first team pay at Barcelona has been calculated at £95,081 per player per week, or £4,944,211 per year in the period under review. Real Madrid’s players in No2 place earned £88,421 per week (£4.6m per year) while first-team stars at the Yankees, at No3, will earn an average of £81,206 per man per week in the 2011 season, or £4.2m per year. Click on graphic (left) to enlarge to see the top 12 in detail. This year’s report has been compiled in association with ESPN The Magazine in America, which carries exclusive details in its 2 May 2011 edition, a special ‘All About the Money’ issue, on sale now. The salaries report features average salary information from 272 teams in 14 leagues in seven sports across 10 countries. ESPN The Magazine carries the top section of that main list online at this link, where there are more links to other content and details about the special issue of the magazine. 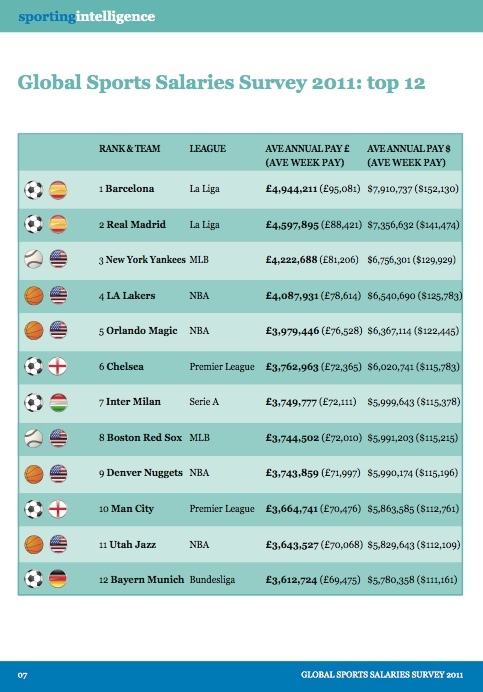 Sportingintelligence’s first global salaries report was published last year and compared average first-team pay on a like-for-like basis for the first time at clubs in the world’s richest and most popular sports leagues. This year’s full report, to be published on Friday, has been expanded to include the dozen most popular sports leagues in the world (by average attendance per game) plus the MLS and SPL as examples of smaller leagues from the world’s most popular sport, football. The LA Lakers and Orlando Magic of the NBA are No4 and No5 in this year’s list, followed by Chelsea of the Premier League, Inter Milan of Serie A, baseball’s Boston Red Sox, and the NBA’s Denver Nuggets. Manchester City, owned by Sheikh Mansour of Abu Dhabi, have stormed into the top 10, with City’s average first-team annual pay in the 2009-10 season calculated at £3.66m ($5.9m) per player, or £70,476 ($112,761) per week. The Premier League remains the richest football league in the world and five of its clubs – Chelsea, City, Manchester United, Liverpool and Arsenal – are among the top 30 best paid teams. The NBA remains the richest league in terms of average pay per player across the whole NBA, and NBA teams occupy 10 of the top 30 places, while MLB baseball teams occupy eight, teams from La Liga, Serie A and the IPL two places each, and the Bundesliga one. The full report 78-page report reveals the best-paid leagues overall, contains 56 pages of league-by-league detail assessing the relationship between money and success, and includes prize earnings for the top golfers and top tennis players to see how team sports earnings compare to those in major solo sports. More details from the report and features based around its findings will appear on sportingintelligence.com in the coming days and weeks. Pre-order information for anyone interested in purchasing the full report is available upon request. Previous post Available from Good Friday . . .